While growing up in Derby Maine a good friend and I were around age 10 when we finally convinced our older brothers to take us brook fishing. Up until then most of our experience was rivers, ponds, or lakes, so fishing for brook trout was entirely new. The two mile trek to the perfect brook went past the Derby train repair shops, across the iron bridge over the Piscataquis River, through the woods on Indian Island, and finally into Milo and an area that was very unfamiliar. I thought they were kidding when they announced our arrival. This brook was barely a foot across, maybe 2 feet in some spots, and meandered through alders that looked like an obstacle course. Reeling off about one foot of line and baiting their hooks, each of the older brothers took off telling us to follow them and fish as we went. Looking ahead to watch their technique, each held their rod vertically while grabbing the end about a foot from the tip. This they poked through the alders to get the one foot of line and worm into the water. This was fishing? The worm was dunked for a brief instant as they each took turns passing the other to the next hole. My friend and I baited up and each picked a spot deciding to leave the worm in long enough for the trout to find it. The brothers didn’t let up, so at times we had to stop fishing and work our way through the alder jungle just to keep them in sight. After an hour and a half of following them and poking the rod here and there, the truth sunk in. These fish were hungry. Our older brothers caught more than I care to mention, while we fished empty holes. They knew every spot and took turns on every other one, leaving us to fish empty holes. Any fish in that brook bit in an instant, so the brothers held the secret while we fished empty holes. Who could imagine such a small brook a foot wide and a foot deep would have trout living there? The experience was bizarre to say the least. No fish. Just empty holes. P.S. 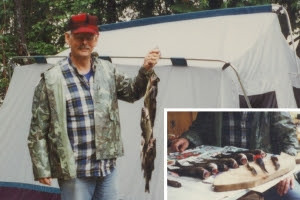 The photo here is a more recent shot of me with a string of white perch taken at Jo Mary Lake near Millinocket.